So you’ve successfully built your own copper still! Hopefully you were able to make use of one of the many home-made still plans I’ve posted. Before you start running your mash through your new still you’ll need to clean it. The first time I built a still I struggled with cleaning the inside, trying to get a brush inside was very difficult. On top of that removing the flux, bit’s of solder and carbon deposits was next to impossible. 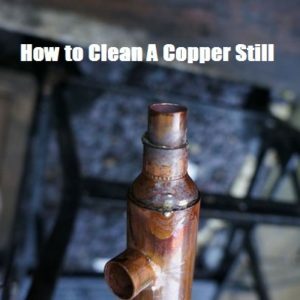 To make your life easier I’ve laid out 5 steps to follow when cleaning your home-made copper still. If you follow these steps you’ll fully remove any contaminants from the inside of your distilling equipment. Step 1 : Soak the column – Using a 50/50 vinegar water solution soak the condenser, parrot and any other smaller parts in the vinegar solution for a few hours. Vinegar is considered a weak acid and does a fantastic job of cleaning copper. After you have soaked each part of your still for a few hours give the insides a light scrub with a long tube brush. Now give it a rinse out with warm water. Step 2: Add Vinegar Solution To Boiler – Fill the boiler with a gallon or two of white vinegar making sure if you’re boiler has an internal element it is fully covered with vinegar, if it’s not add more vinegar. If your using a stove top or propane boiler a gallon should suffice. Step 3 : Turn On Your Still – Fire your still up and allow the vinegar to boil for 30 min or so. I personally like to leave the condenser turned off during this step as it allows acidic steam to fully clean the entire inside of your still and condenser. You’ll want to do this either in your garage with a window open or outside as you will be producing quite a bit of moisture during the cleaning process. If you’re cleaning a reflux still there is no need to add packing material we are simply trying to clean the column and condenser at this point. Note 1: If you’re cleaning a Vapor Management (VM) still you may have trouble getting steam to pass through the take off valve. If this is the case check that the valve is fully open if it is and no steam is passing through it you can try capping the still but make certain the take off valve is fully open so that no pressure is built up within the still. Note 2 : If you’re heating your boiler with an internal element make sure that the element is fully submersed below the vinegar solution during the entire 30 min cleaning process. Because your not running the condenser vinegar vapour will be exiting the still causing the level of vinegar solution inside your boiler to decrease over time. Failure to maintain liquid level will cause heating element to burn out. Step 4 : Run The Condenser – After running the still for 30 min turn the condenser on and start running your still as you would if you were distilling mash. At this point liquid should be exiting the condenser instead of vapour. Take a moment to check the still for leaks, to do this use a small glass mirror ( I found my wife’s hand mirror works perfect for this ) and check all soldered joints, seals or compression joints. The mirror will fog up if a leak exists. If you find a leak fix it before you proceed. Leaks could cause a serious fire hazard when you start running your mash later. Once you’re confident that their are no leaks shut down the still, pour out the vinegar solution, give the inside of the boiler, column and condenser another scrub and fully rinse with warm water. Step 5 : Sacrificial Ethanol Run – I like to run ethanol through the still to fully clean it. I’ve had a few cases where the distillate coming from the still during the first run tasted off as it seemed to be picking up impurities from the column/condenser. I found it was easy to eliminated this by doing a cleaning run first with ethanol. You can either ferment a cheap sugar wash or use the tails that you’ve collected from previous runs. While you’re running this wash take the opportunity to become familiar with your new still. Any ethanol you collected from this run should be discarded or marked as not for human consumption. You can use it the next time you build a still. Here is a video from Chase over at Still It explaining how to clean your new still! Now that you’ve got the inside clean it’s time to make the outside a thing of beauty. After all what’s the point if you can’t be proud to show it off. I’ve put together this Step to Step Guide to Polishing A Cooper Still. If you’ve got a better way to clean your still lets here it ! Drop us a line below ! 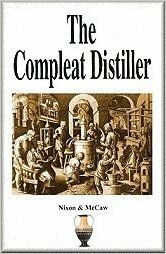 One Response to "How To Clean A Homemade Copper Still – Removing Flux, Solder & Carbon"
I’d suggest that that first sacrificial alcohol could perhaps still be used. Most of the scrudge in it is going to be dissolved solids, nothing that re-distillation wouldn’t get rid of. I’d mix it with my next batch of mash and run it through again.